This is great news, not least because Kyenge is currently being sued for daring to call out this racism for what it is. The former Italian minister of integration and current member of the European parliament is facing trial for defamation for calling the League party racist in a 2014 interview. Kyenge has been the subject of a torrent of racist attacks by senior members of the party since her election to public office in 2013. However, the legal action taken against Kyenge is now somewhat undermined by the conviction of Calderoli – a key perpetrator of this abuse – for his actions. 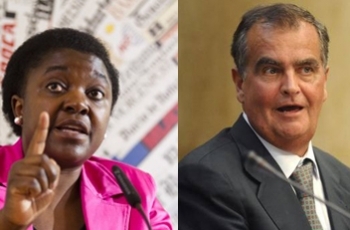 The leader of the League and Italy’s interior minister, Matteo Salvini, took the legal action against Italy’s first black cabinet minister in September 2018 for her comments. This is the man who compared African immigrants in Italy to slaves in the same month. Nevertheless, anti-racists from across Europe have since rallied to support the MEP. In October, an open letter to the Guardian signed by nearly 40 black MPs and community leaders expressed concern that such a case had been allowed to open. Kyenge also spoke alongside Dianne Abbot MP at an event at the House of Commons organised by Operation Black Vote in November. A petition has also been created to help you show solidarity with Cécile Kyenge MEP. In this back-and-forth battle of defamation claims, this week is, at least, a small but significant victory for Kyenge as well as the civilised world. The conviction of a senior League politician as racist will hopefully help Kyenge’s defence against defamation as it becomes clear that she was simply stating facts.